What are the best and worst minigames? From Gwent to BioShock's hacking, they're all here. - What's your favorite Telltale game or episode? From momentary vehicle combat to hacking and cards games, minigames have a variety of functions. Sometimes they're great, giving you optional paths to engage with when you're looking for a change of pace, and other times they're crowbarred in to a game's detriment. They can provide further detail to a setting, or they can infuriate and increase the chance of the game being uninstalled within the next ten minutes. Minigames are used for all sorts of things, then, as this week's PCG Q&A explores. Let us know your answers to the following in the comments: what are the best and worst minigames? I sometimes think I'm the only person who likes Final Fantasy's underwater football game. I love how it has its own progression and move system, and that you recruit NPCs around the world to join your team, needing to pay them a salary for each match. It heightens the idea that Blitzball is an important part of life in Spira, the game's setting, and means that there's a strong connection between this minigame and the rest of FF10's journey. Bioshock's pipe puzzles would've been fun in moderation, but there are so damn many of them that they become arduous by the second half of the game. I like hacking represented as something visually interesting, but after a while they just slow the pace of the game down. Bioshock 2 found a way to keep the game's pace up while you were hacking turrets and the like. I'm not sure it's worse than racing in Pandemic's The Saboteur or the original Mafia, but it's the minigame I've groaned at the most. It's a dead-simple word matching game, but it blends wonderfully with the theme of Phantom Doctrine. The gesture of moving around procedurally-generated clippings and photos, pulling lines of red yarn between them to form connections adds to the pacing of the 40-hour campaign, providing a paperwork break, as odd as that sounds, from occasionally tedious infiltration missions. I talked about this more on a recent Three Moves Ahead podcast. I'm looking forward to Xenonauts' sequel a lot. Before imitators like Phoenix Point came along, I was calling it "XCOM Grad School." But I really hope that its air combat gets a new interface, or is just a less prominent part of the experience. It's an exhausting distraction, having to click out flight paths for multiple jets, alternating between pausing and real-time to execute commands. The best minigame is a bit of an oxymoron, but I like logic puzzles, and the "figure-out-the-passphrase" game of Mastermind that comes up in Fallout is okay. It's not particularly hard, and it thankfully doesn't come up so often that it becomes completely onerous. But it's never going to become a standalone spinoff like Gwent. One of the worst, and I'm not sure if you can even call it a game as such, is Elder Scrolls Oblivion's manipulation/persuasion minigame where you try to make people like you. The problem being you had to usually loop through the same responses multiple times to 'max out' your reputation with someone, and you could potentially play this game on every person you talk to. It wasn't hard to figure out the rules of the game, and it was old and annoying after the first few times I did it. Unfortunately, there were hundreds more NPCs to persuade, and part of my brain wanted them all to love me. I'm gonna almost completely disagree with Jarred here. I didn't think highly of it when I first played Oblivion, but darned if I don't miss its Speechcraft minigame. 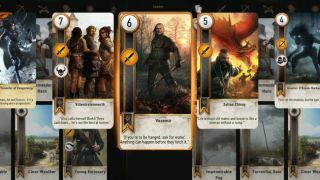 These days I kinda wish there was a standalone version of it, like Gwent. It's absurd, naturally, in that the key to raising someone's opinion of you involves quickly admiring them, bragging about yourself, joking with them, and threatening them. Threatening them! And even though each person hates having some of these things done to them, you still have to do all of them each time, just in a way that minimizes how much they hate it. It's weird and nonsensical but it's also sort of a fun game, watching their expressions change as you hover over a colorful wedge-wheel before making a boast, saying they're pretty, threatening their life, and then dropping a zinger. It's weird and pretty dumb, but I both love it and miss it. If Bethesda released it as an app I would play it daily. I do enjoy the little dingaling sound when you successfully hack in Bioshock: it's pleasant and soothing. But I'm not a big fan of Pipe Mania or Pipe Dream or whatever you want to call it. I got tired of it almost immediately, and I don't understand why there are pipes of water flowing through vending machines and sentry guns anyway. I mean, thematically, I get it, but logically, making a machine love you and give you discounts shouldn't involve fixing their plumbing, unless they are actually toilets. I've spent many, many hours across many playthroughs beating Final Fantasy 9's NPCs at the card game Tetra Master, and here's the dirty secret: I still don't understand how this game works. Honestly, I'm convinced no one fully understands Tetra Master, including the people who designed it. And yet it's a blast despite that fact. The core game is all about positioning cards on a grid, with each card representing a monster or character from FF9's extensive bestiary. Cards have differing arrow layouts on their sides and corners that represent attacking, and the object is to turn your opponent's cards to your color by attacking them. Whoever has the most cards of their color at the end wins. It's simple until you get into the strengths of the cards and what the mess of numbers and letters on them mean, at which point you'll have to consult a wiki. And you probably still won't get it. But jockeying for positioning and setting off combos that ripple through multiple cards is somehow even more fun with the danger element of never being quite sure what the hell's going to happen. You guys answering BioShock's pipe hacking minigame must never have played KotOR or blocked this from your memory, because it's infinitely shittier. The worst minigame in a good game, by a longshot. Who wants to drive a speeder that controls like a ton of bricks down a drab, completely straight corridor? There aren't even turns. I still can't believe this shipped in the game. I'm going to second Wes's Tetra Master suggestion and just say that I love all the Final Fantasy minigames. Chocobo racing and breeding in 7, Triple Triad in 8, Tetra Master in 9, Blitzball in 10. Even the Blitzball manager thing in 10-2 was pretty great. I'm gonna go against the tide here and say I actually really like Bioshock's pipe minigame. I don't know if I'd call it the best minigame out there, but I didn't totally hate it. Worst: Nier: Automata's Hacking. It's an overly complex bullet-hell minigame that's often punishingly difficult, made worse by it being forced as the primary mode of combat in the second route through the game. I found it bothersome enough that I actually never finished that second route, even though I'm dying to know the full and complete story of our intrepid androids' fates. The beautiful, atmospheric Westwood adventure game had a few plot holes, but it captured the world's atmosphere obsessively, right down to the police gadgets Deckard uses in the original film. I could just have easily chosen the photo enhancer that lets you zoom and pan across pictures to unlock clues—even the sound effects are spot on. Instead I'll nominate the Voight-Kampff test. The machine measures the subject's nervous responses to questions designed to incite revulsion, which replicants find difficult to emulate. You choose your questions and watch the interviewee's eyeball quivering on a dusty monitor as their heart rate changes. It's hard to tell if there's really a system behind the questions, but whenever you put the Voigt Kampff on a character, you really feel like a detective in that incredible world. These sound great on paper. You've got an open world with horses in it, why not have the player race against other horse riders? Hey, people race in cars right? The trouble is they are always trivially easy, or they are a total roadblock. It's really hard to make racing feel fun. The vehicle (or animal) needs to feel awesome. The AI needs to give you just enough challenge without nailing the perfect racing line every time. I can't think of many that come close to being fun. If I want to do some racing, I can go play Forza Horizon 4 instead. A minigame so good it spawned its own standalone game—admittedly one that made sweeping changes to almost every rule, becoming something far more complicated and confusing. The Witcher 3's original card game is the star of CD Projekt Red's RPG, offering a deeper way to interact with the world. It gave me a reason to explore the world outside of the clearly marked quest objectives. A tavern in a small village might be selling some new cards, or at least offer a new opponent to test myself against. It's just deep enough to be the perfect pastime, and just exploitable enough (thanks, spy cards) to let you feel like you're mastering the hobby. In fact, I enjoyed Gwent so much, that I interviewed the team that made it. Alpha Protocol is a fascinating, compelling, unique RPG, and also a bit broken in some fundamental ways. But nowhere is it worse than it when it asks you to hack a computer. As in real life, hacking involves a basic word search—trying to find specific codes hidden among a nauseating scroll of letters and numbers. But even when you look through the tragic eye puzzle and manage to focus on the bits of it that aren't moving, you then have to actually move two text boxes into position. This is easier said then done because, while the left-hand box uses WASD, the right hand box is controlled by mouse using some of the floatiest movement handling I've ever had the displeasure of trying to complete to a time limit. Sometimes I think Alpha Protocol deserved more recognition than it got. But then I remember the hacking game, and no, it probably didn't.